Special limited offer: Buy 2 NicoFix 50ml and get 1 NicoFix 50ml free! NicoFix Should be applied in 0.05ml doses. Rub just two pumps or four on the palms of your hand. The near clear gel will be absorbed in under a minute. Moisturizing your hand as it provides you satisfaction. No product containing Nicotine or Tobacco is completely safe. Tobacco has been shown to cause some kinds of cancer and nicotine is highly addictive. There is 10 times less tobacco and nicotine in each application of NicoFix. Clinical Studies have not proven that products that contain less Nicotine or less Tobacco are safer or lessen health risks. 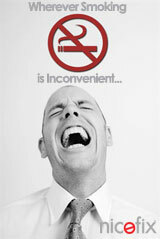 It is better to never start using Tobacco Products or quit completely. If you are under 18 years of age or have never used Tobacco Products, NicoFix does not want to sell you our products. NicoFix was developed to provide existing smokers and tobacco users with a product that contained less Tobacco and less Nicotine than cigarettes, but provided equal satisfaction. Copyright © 2019 NicoFix UK All Rights Reserved.